SPW020633 SCOTLAND (1928) [Unlocated]. Unlocated moorland. An oblique aerial photograph. Pennawd [SPW020633] Unlocated moorland. An oblique aerial photograph. Are these parallel lines evidence of peat cutting? If so, it's happened on quite a large scale here. Moorland where peat has been extracted would narrow it down a little bit. Maybe it shows different vegetation where land drain pipes are dug in underneath. Sometimes these wide bands are evidence of medieval field systems- strip lynchets. On moorland it's more likely that it's drainage and improvement? This is an rope-incline railway - looks like a winding engine building here - maybe the Cromford and High Peak - which linked the Cromford Canal to Rowsley on the main line. If it is a railway, it's not the CHPR. Their inclines were double track all the way down. There were other inclines, though, that used this short passing loop arrangement. A passing place on a single-track railway line? Unlikely, as the geometry and scale of the feature does not fit that of such features on a railway. It looks much more like a farm track where a new route has been selected around a wet patch.... indeed farm tracks, with tractor/wagon ruts, do have some the of the characteristics of railway lines if not the conventional geometry. 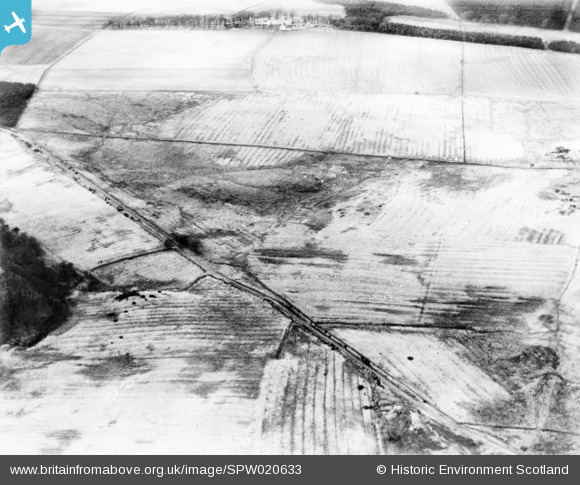 Looks to me like a minor road or farm track crossing largely level counryside - I don't see the evidence for it being a railway but happy to be corrected.